Here’s the first evidence based on projections of market share showing why BigLaw firms must start remaking their business model now. And by implication, the consequences of not doing so. Where the market shares of the major players in the legal services industry are headed in the next 10 years makes a major and urgent case for traditional commercial and corporate law firms to act sooner rather than later. This report sets out the research underpinning our conclusion that firms based on the BigLaw business model must start remaking now. 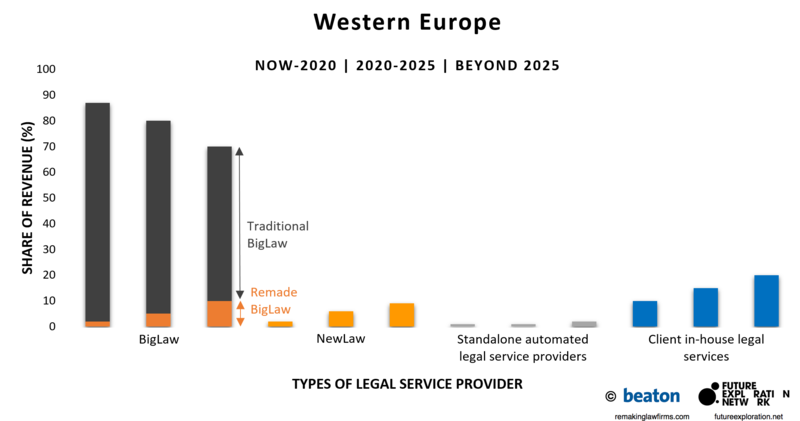 Later publications will explore differences between regions and speculate how the different types of legal services provider will fare over coming years. In collaboration with Ross Dawson of the Future Exploration Network beaton has analysed the B2B sector of law, i.e. clients and providers of commercial and corporate legal services in five regions of the world: Australia, Canada, England & Wales, US and Western Europe. The law firms we have studied are all based on the BigLaw business model, the indicia and implications of which are explained here and in Remaking Law Firms: Why & How (published in March 2016). 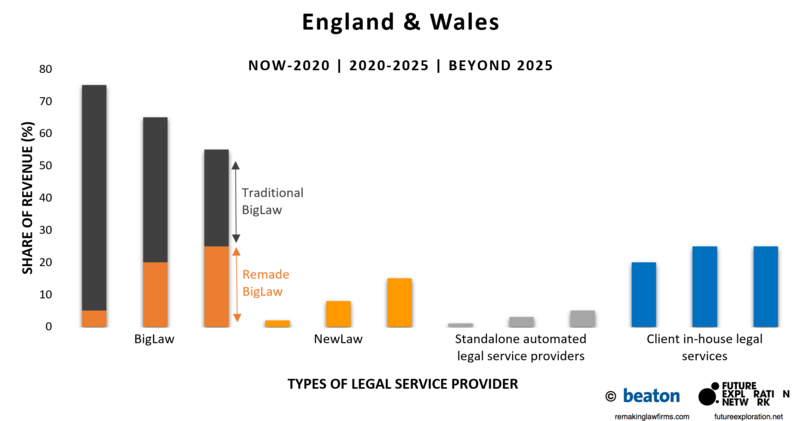 Our research combined identification of mega-forces with scenarios to assess the impact of the forces on the five major types of legal services provider over the next 10 years. The shares of revenue refer to income to the traditional and remade BigLaw firms, the NewLaw firms and the Standalone automated providers. In the case of Client in-house legal services the measure is the cost of these services to their parent corporations and excludes spend on outside counsel. Shares of revenue, as defined above, are shown in the charts below in three 5 year periods: From Now to 2020 | 2020 to 2025 | Beyond 2025. The shares are estimated projections, not precise forecasts, charted to show the temporal trends and regional differences. We drew on the insights of 21 invited thought-leaders and practitioners in the five regions and warmly acknowledge their contributions in the footnote. We accept responsibility for the conclusions. Traditional law firms based on partnership, lawyer-centricty, leverage, and input-based pricing (known as BigLaw numbering at least 100,000 in the five regions) . Remade law firms (probably better expressed as BigLaw firms in the process of being remade such as Allen & Overy and Seyfarth Shaw – both of which are featured in Remaking Law Firms). NewLaw firms based on a quite different business model to BigLaw (read these posts for a deeper understanding of the range of NewLaw providers such Elevate, Conduit (recently acquired by Deloitte), and LOD). Standalone automated legal services (based on information technology and artificial intelligence such as Lex Machina and KIM). Legal departments rendering a wide range of legal services to their owner corporation. Our study has identified five mega-forces that will drive the supply and demand sides of the legal service markets over the coming 10+ years. These forces are shaping the nature and volume of clients’ needs and how these needs will be met. Hyper-competition. Hyper-competition will cause changes in industry structure, including clearer delineation of strategic groups and proliferation in the number and type of legal services providers, and intensifying supply-side competitive dynamics. De-regulation. De-regulation will progressively reduce, even remove, restrictions on almost all aspects of the ownership of providers and the ways in which legal services are delivered. Client transformation. The speed and intensity with which clients transform the ways in which they meet their legal needs will occur more rapidly than most anticipate. Exponential technology. The impact of technology as a substitute, not just a complement, for lawyers’ services will be more dramatic than most predict. BigLaw firm inertia. In the main BigLaw firms will be slow to develop the capabilities in change management and innovation that are needed to remain profitable in the conditions expected after 2025. The sum of the % share of each type of provider in each period (Now–2020, etc) is 100. In other words, changes in the height of the columns represent gains or losses for each type over the three time periods. The outcome for each type of provider in a region depends on its starting point in Now–2020 and the speed and intensity with which the mega-forces affect all players that region. In commenting on the charts our focus in this report is primarily on the impact on Traditional BigLaw and Remade BigLaw firms. The combination of Traditional BigLaw and Remade BigLaw firms loses share to other types of provider in all regions. Remade BigLaw gains share at the expense of Traditional BigLaw, earliest and fastest in England & Wales. Australia and UK are most similar with Remade BigLaw making the largest gains. Client in-house legal departments gain the largest share by 2025 in the US. Western Europe experiences the smallest changes in all types of provider. Major structural change is occurring in the legal services industry. It’s most evident in common law jurisdictions. The majority of traditional law firms are at risk of being overtaken by the tide of change. As a consequence they will suffer reduced capacity to invest in serving their clients and progressive falls in profitability – a vicious downward spiral. A small number of pathfinder BigLaw firms are starting to demonstrate the advantages of remaking their business models. The rise of alternative business models is inevitable as clients recognise the benefits of choice and exercise their sovereignty. All these changes are typical of an industry entering life cycle maturity and, while novel in law, are well understood in other industries. The impact of the mega-forces can be successfully addressed in law – provided firms start now in earnest. The messages in this post are primarily addressed to BigLaw firms and their clients, but they also have relevance for the other types of legal services provider, educators, regulators and professional societies. We invite your critical review of our findings and your comments on the implications. Please note as we receive feedback this post will be modified and updated as a reference source for future publications and extension of the research. Contributors from Australia, Canada, England & Wales, US and Western Europe shared their views with us. Many, especially from BigLaw firms, requested anonymity which we have respected. Our thanks to Eva Bruch (Spain), Peter Carayiannis (Canada), Jeff Carr (US), Liam Brown (US) and Charles Christian (UK) for their generosity in contributing their views to this research. Ben Farrow assisted with the analysis and presentation of the findings. The projections are the opinions of the authors. They do not represent averages or other measures of central tendency of the views of contributors. Great article George. The dynamics bringing about change in the legal industry are growing in intensity. The pressure on all law departments to do more with less and to prove the value they deliver is significant. Law firms who embrace that change and who take the time to truly understand their client’s internal value proposition will chart a path for sustainable and profitable growth. Interesting approach to quantifying the scale of the risk. Looking forward to the discussion of your findings. 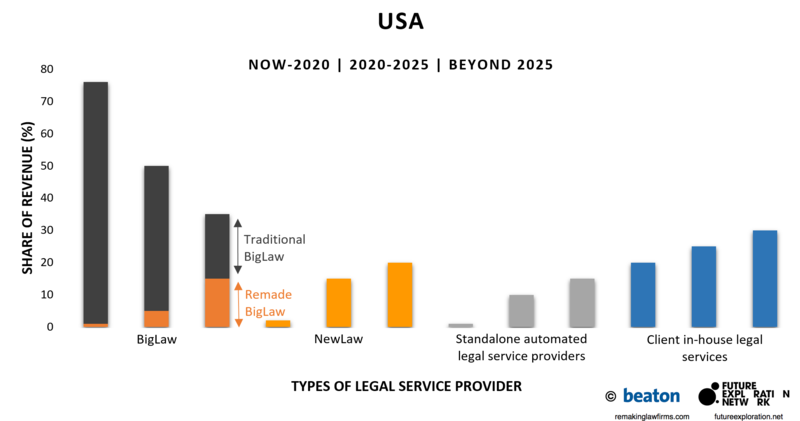 Is there perhaps also a model between BigLaw and Remade Law where sub’s and affiliates emerge as a means to innovate within traditional structures? •	Lack of innovation within an industry and clients feeling trapped, creating opportunity. The article is thought provoking and I think that technology will play a greater catalyst than people anticipate. There are mega forces at play within technology as well and this sea change within technology will carry into the legal industry. The law industry will change; clients will demand it… The speed of change maybe something people can debate… I personally think it will be faster than outlined, but time will tell. One last point, I have recently (last 10 years) seen and increasing trend, where innovation (business models, technology, process, etc.) are moving faster outside of the traditional US market and then being imported back into the US. Regardless of where the IP was first develop, the application of IP to transform businesses is faster outside of the mega markets. Brian thank you for your comments and commendation. What intrigues me most is the question of just how fast the future is approaching? Put another way, how much time do incumbent BigLaw firms have to remake themselves? You suggest the future is coming faster than most realise (or are willing to acknowledge). I agree, but on what evidence can this be validated? If technologies like the smartphone are anything to go by, it’s a whole lot faster than even the most perspicacious envision.